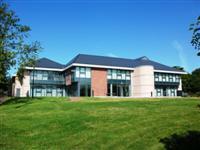 Services / facilities within the building include a lecture theatre, teaching rooms, library, Wet Laboratory and a Business Incubation Suite. The venue is situated outside the centre of the town. This venue is situated in Whitehaven. The nearest mainline station is Corkicle. 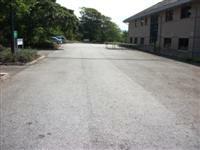 The car park is at the back of the venue. 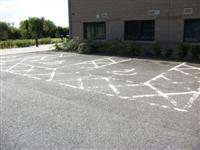 The dimensions of the designated parking bay(s) are 400cm x 610cm (13ft 1in x 20ft 0in). The nearest designated bay is 30m (33yd) from the main entrance. The furthest designated bay is 42m (46yd) from the main entrance. There is an easy slope in front of the entrance. The door opening is 185cm (6ft) wide. 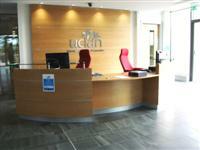 The reception desk is 10m (32ft 10in) from the main entrance. 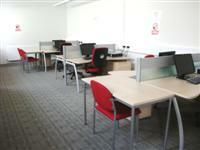 Hearing loops are fitted in most teaching rooms. 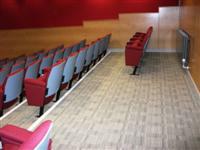 There are designated spaces for wheelchair users at the rear of the lecture theatre on the ground floor, shown in photograph 2. 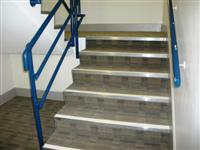 The floors which are accessible by stairs are G-1-M. There are also stairs in the main atrium (shown in photograph 2), which give access to the first floor only. You are on Lift (Main). Skip to the next section. The lift is located in the far left corner of the main atrium. The lift is 18m (20yd) from main entrance. The clear door width is 88cm (2ft 11in). 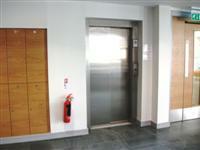 The dimensions of the lift are 109cm x 140cm (3ft 7in x 4ft 7in). You are on Lift (Mezzanine Lift). Skip to the next section. The lift is located on the first floor, behind the main lift. 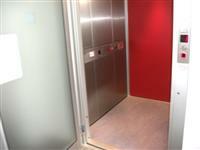 The floors which are accessible by this lift are 1-M. The lift is 6m (19ft 8in) from main lift. The dimensions of the lift are 103cm x 137cm (3ft 5in x 4ft 6in). This library does not have a regular supply of books in large print. This library does not have a regular supply of books on tape or disc. The library does not have computers with accessible software. Auxiliary aids are not available for computer users. 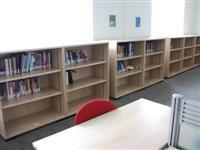 The library is located on the mezzanine level of the building. You are on Restaurant Bar Internal (Restaurant). Skip to the next section. 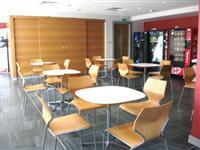 The nearest table is 10m (32ft 10in) from the main entrance. The restaurant is located directly to the left of the main entrance as you enter. 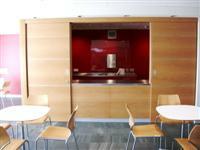 It does not sell food or drink, but the counter is used to serve food for functions using the lecture theatre or other rooms. Students can use the vending machines and seating when it is not being used for functions. 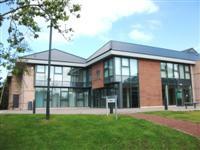 The accessible toilet is 26m (28yd) from the main entrance. The accessible toilet is located on the far left hand side of the main atrium as you enter. The dimensions of the accessible toilet are 146cm x 221cm (4ft 9in x 7ft 3in). It is out of reach (higher than 10cm (0ft 4in) from floor). There is an identical toilet on the first floor (shown in photograph 2), except it has a functional alarm. The female and male toilets are located on the far left of the main atrium as you enter. The female and male toilets are 24m (26yd) from the main entrance. There are also toilets available on the first floor. 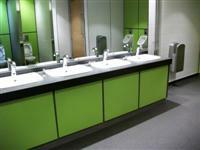 The toilets contain cubicles with grab rails fitted and doors that open outwards.